One of my geothermal units. I wanted to check with my new service company (Perfection Contracting in NJ) before I wrote this post, but Brian asked in another later post, if I could respond to him as quickly as I can since he is breaking ground this week. So, on Sunday evening I am trying to answer his questions without the benefit of checking my answers with my geothermal company. If any installers have anything to add, please do since I am not an installer, but simply a homeowner who drove my installers crazy asking questions. Brian-My geothermal system was installed about 3 years ago. We used Water Furnace equipment to heat and cool the house, for radiant heating in the bathrooms, and for hot water through a separate geothermal hot water system.In addition a loop was set up so in the summer, hot water would be created for free because the heat of the geothermal units would “dump” into the hot water tanks. Since we have installed our system, Water Furnace now sells more efficient units than the ones that I own. So, I can’t tell you the cost because it would not be accurate. Another house in town has geothermal, but his whole house is radiant and he uses his radiant boilers to heat his pool in the summer. If anyone is considering using their geothermal leftover heat to heat their pool in the summer make sure the water does not circulate back into the house; otherwise you could have your pool in your basement if something goes wrong. A heat exchanger is installed in a pool house out by the pool so the pool water is heated outside rather than in your house.I need to check on the right words.As I mentioned earlier, in my haste to answer Brian, I can’t verify if this is the correct terminology without the help of my service company. Another smart idea this other homeowner implemented was to install a back-up heating system for the geothermal. Up north, a geothermal system does not do as well when the temperature dips to 20 degrees depending on your insulation. In my case it is around ten degrees because of my Icynene insulation (open cell foam). I would imagine the better the insulation, the less likely the geothermal system would have as much trouble. When the system is having a hard time keeping up with its demands, it will go to back-up heat which is full electricity. This is an expensive stage. It is one watt to one watt electricity at that point versus 1/3 watt to 1 watt electricity other times. I would recommend in your area to have an efficient gas or solar system that would take over before the system goes into its back-up situation or if a geothermal unit or loop fails. These closets need to be designed so that the installer does not put the units where it is impossible to build these closets, like too close to the side of the attic near the soffits. Your architect and installer will need to meet so your builder knows where to build the closets. Build them as you are building the house, not after the fact. The units are so much more efficient when they are in a conditioned space. I still have to build closets around my system in the attic since I was told after the fact by another installer. In addition, I am going to spray icynene on the ducts in the attic because most installer only put R-6 on the ducts which was energy star’s requirement.The more insulated around those ducts, the better. If I had my druthers then I would have put all my ducts, geo, etc in a conditioned space. (i.e. ducts in my first floor ceiling and units in 1st or 2nd floor closets.) I was told and I have not verified this, but energy star now wants your ducts in conditioned space. It makes perfect sense.Everything in conditioned space has to do better. All Units in the Basement? Another issue is since the units are in the attic; the water inside the geothermal units is pumped up to the attic so sometimes it sounds as if the wall is making a low rumbling noise.This may be due to how the pipe was attached to the framing, and was it insulated properly to reduce this noise. Note, that only one of my units makes this noise so I suspect it was an insulation issue for that particular pipe. My new service company told me they like all of the units in the basement and only the condensers and ducts upstairs. This is called a split system. I am not sure if you need to build closets in this situation. This split system eliminates the noise and possible water issues in the attic. Brian, it may be something for you to discuss with your installer. All units in the basement or not. Also, when the installation is done and as dumb as this may sound, make sure your geothermal systems are set for whatever system you have. There are open and closed systems. Mine was set for a well when I in fact have a closed system. In addition, make sure the air flow in the house is balanced the way you like it. For example, you may want more air in rooms that are used versus not used.All my units were not set properly.I think this had to do with the head of the Company passing away.I had a lot of issues because of his untimely death. I think my situation is unusual.None of these issues were due to the Water Furnace equipment but rather the installer. As for drilling, if I remember, I think my wells are about 300-350 feet down. I am on a hill so everyone is different.In my area, the excavation of a horizontal loop may have been more expensive than a vertical loop. The other house that I spoke about added a few wells in case he needed them later for future expansion or something happened to one of the wells.I thought this was smart idea if you may want to add to your house or add an additional structure. What would I have done differently? I would have the installers set up the radiant hot water on it own geothermal boiler system and not tied it to a geothermal furnace unit.Now, if the radiant is calling for heat, the furnace has to wait to heat part of the house.It does not happen often because my first floor does not call for heat that much. I also would have installed the system as a split system and put closets in from the beginning. Make sure you have surge protectors on the units. They are electrical. An electrical surge could damage the units. We have many outages where I live and it caused a problem with one of the units. As for maintenance, I have dampers on my second floor since a couple of the units heat some rooms and others heat other rooms.Sometimes, the dampers get stuck and the units will not shut off. (Dampers allow for one unit to heat several rooms by shutting off the heat to some rooms when they reach temperature and keeping others open until they reach desired temperature.) The damper problem has only happened with the heat. I am not sure why this is happening, but my second damper issue is happening right now.Is this because it is up in my attic and it is cold?I don’t know but my service installer is coming tomorrow.I have already had one damper replaced. I have a ten year warranty on the units but Water Furnace only reimburses for some of the labor cost and parts. In addition, you need to have the units checked twice a year like your normal heat and air conditioning system. Ask what that is going to cost in advance, so you know. I would also suggest buying 2 sets of filters for each unit.You have to wash them sometimes.As they dry, you can install the other one. I keep my downstairs and upstairs at 68 during the winter and during the summer my downstairs is 76-78 and upstairs is at 74-76.I have an energy star house so I had to have all the duct seams mastic (which I would encourage anyways). Anywhere you could “swipe” a credit card through two pieces of wood, I had to use silicone to close the gaps, and I had to pass their blower door test.All 3 floors have Icynene (basement through 2nd) in the exterior walls. Geothermal savings are more in the summer than the winter but don’t believe the 70 percent figure you hear unless you live where it is warmer. I think I am more like 50-60 percent in the summer and 40-50 percent in the winter but I don’t know. It is hard to know because I only have an electric bill which includes all my lights (which is pretty efficient lighting) as well as my geothermal. I compare myself to houses that are new construction using gas.Perhaps I am doing better than I think. I was told that my savings would be about 20-30 percent in the winter and 70 percent in the summer.These numbers may not take in account the Icynene.I know that has impact. Also, don’t forget to check out what your state’s incentives and rebates are. Water Furnace has a nice savings calculator for you to use to see what your savings would be if you installed a geothermal system versus a conventional heating and cooling system. Before you enter in your information, make sure you know your per kilowatt cost for electricity and cost for natural gas. In addition to the savings, I like the fact that there are no condensers outside like you see in conventional air conditioning systems. The system is very quiet except that one wall that rumbles a little. Water Furnace also makes an energy recovery system . In addition , I have 2 humidifiers which put moisture in the airin the winter.They are made by Aprilaire and are the wrong units for the geothermal units. They were put in by the Company after the boss passed away.I have retrofitted them to work. Again, Water Furnace makes their own humidifiers to work with the system. Since the geothermal system does not heat water as hot as boilers, they need humidifiers that can heat their own water. There are specific humidifiers that are made to be used for geothermal systems. Whoever you use, make sure you get a couple of references. Try to get references from people who have had their geothermal systems for at least a year or so. You want to hear from someone who already went through both a heating and cooling season. In addition, see if you can get a reference from someone who has the same size house that you are building. Ask them for a copy of the electric bill.It should show you their electrical cost for the whole year. As for solar, I looked into that too.It was too expensive for the savings that I would receive.This is totally off the top of my head, but I remember that 3 years ago, the cost of the system was about $60,000 or so and NJ gave back 60% I think.The problem was a 10k system which was only going to produce 13,500 kilowatts. At the time it was 9.8 cents per kilowatt in NJ, my savings for the year would only be $1323.The payback (15-18 years) would be horrible based on the cost of the solar panels. I am waiting for more efficient and less costly solar panels. In addition, NJ has changed its program. You bet I would in a heart beat. I love this system despite some of the installer issues. It is quiet, efficient, saves me money, and helps the Earth. What else can I ask for? Brian, I hope I was able to answer your questions. Please let me know what you decide.If you have any further questions, post again. Looks very interesting…just watched the video. Looks like it would be a pretty involved process though to install everything needed, and expensive but in the long run I’m sure its worth it, plus its environmentally friendly. I first got into Green technology when I learned of solar paneling and then some small wind turbines. Matt-I actually feel for the money that geothermal is quickest payback for me in the northeast. I have an article about a wind turbine in the que if I can ever finish it. I would really appreciate your comments on this article when it comes out. I have mixed feelings about this particular wind product. Readers, my service company showed up today to find that someone had stepped on a damper wire up in the attic. So my damper is fine. So the only true maintenance I have had on the system is the one damper. All of the other issues were installer issues. I have been designing and installing Geothermal Energy Systems (water-source heat pumps) in the Northeast since 1978 and the outdoor temperature should NOT be an issue. The equipment that I use (Hydron Module) is manufactured in South Dakota where it gets a LOT colder than here (i.e.- minus 40°F) and they work perfectly. Water Furnace makes a fine unit, too, and is fully capable of handling sub-zero temperatures. Most likely, your equipment is undersized for your home and/or your loop field is too small and too shallow. I checked out the link you sent me on the alternative post and beam builder,, seems like a great idea, seems it would be more money to do it their way. The Yankee Barn Pricing and customizing the cost and materials is going to be easier on the wallet and i won’t be giving up anything in comparison. do you have an e-mail and or tel# so we can talk more about desiging a system using the hydron equiptment . I like that you have the answers and even better your local to my area and could actualy be hired to do some work. I think one of the first things it to design the house around the geo system, and that will be in motion in the next 3-4 months, so it’s getting close to getting a plan that will suite the home best. I spoke with one of the design engineers at New Energy Works about your home, and he gave me some very interesting input in regard to cost comparisons and construction differences for Yankee Barn. From your comment, I can’t tell if you actually spoke with someone at New Energy Works, but I recommend that you do. You are at the beginning of a very big and expensive undertaking. You need to make sure that you have investigated all of your options completely. I have used Yankee Barn on projects in the past, and they do produce a good product. But on recent projects, New Energy Works offerred the best overall solution. Bringing the Geo design into the home project early is a GREAT idea. Almost no one plans ahead like this. As for contacting me, you can link to my website directly from clicking on my name at the top of each of my postings and get my contact info there. Gary, I am stuck on a tough decision. I was hoping you or someone else can help. I am trying to decide on which is the better unit. Water Furnace or Hydron Module. We are getting a 4 ton system and live in Michigan. From what I gather the Hydron is slightly more efficient than the Water Furnace. We have forced air if that helps. We are ready to buy and have narrowed it down to this but there is about a $700 difference between Hydron Module and Water Furnace. What do you recommend? Curious problem you have that they will not cover a faulty part. I thought the 10 yr warranty was supposed to cover everything? Apparently that is not the case. I would like to discuss this further but I don’t know how to contact you. Hi Gary, thanks for responding. Readers, Gary is an architect and engineer as well. I may not have been clear what I wrote. My geo works fine when it gets very cold except that it may go to the electric back-up if it is not meeting the heating demands. When it goes to electric back-up, the cost to run it gets very expensive. It is similar to having an electric heat. It is 1 to 1 kilowatt at that point and significantly more expensive than when it normally runs. I had an incident last winter with one of my geos where it could not meet the demand because it was programmed wrong. (Long story.) My bill increased 50% because it was running all the time for 2 weeks and probably went into electric back-up. My system is not undersized for my house, and I am extremely insulated since I am an energy star house. You bring up a good point. How do people know if there systems are adequately sized or oversized given a closed or open celled insulation? In addition, can you tell us about the systems you install and design. Also, can you tell us for different areas what should people expect their heating and air conditioning bills to look like per square foot if you can. What do you also think the payback on a system should be too. I did not mean to insult your house, quite the contrary. And I thought (for some reason) that you had a horizontal loop instead of a vertical loop. I personally believe that vertical loops in the Northeast make a lot more sense. First this is because we have a lot of rock close to the surface which makes deep trenches for horizontal loops very expensive (or impossible in NH- the Granite State). Second, vertical loops draw from energy from a deep (>100′) ground temp of approx. 55°F in this region versus 42°F for ground close to the surface (<12′) which makes for much better efficiencies. If your backup heat comes on only if there is a problem with the water-source heat pump, then that is exactly what the backup heat is supposed to do- take over if the primary heating system is not doing the job for whatever reason. You asked, “How do people know that their system is adequately sized..?”. For our Clients (my company is VIRSTAR Corp.- http://www.virstar.com ), we start every project with an in-depth energy analysis for the home, commonly called a “Heat Calc”. This takes into account the floor, wall, and ceiling areas that are exposed to outdoor temperatures and, using the R-value for the insulation, calculates the heat loss for each of those surfaces to arrive at a total heat loss for the home. Factors such as the U-value (inverse of R-value) for windows, door, and skylights are also factored into these calculations. There are many such heat calc programs (usually a spread sheet type of program) available on the Web. However, most of them do not take into account heat losses due to air infiltration or, more often, throw in a factor for these losses. For homes such as yours that are insulated with Icynene or Polyurethane foam, this air infiltration is reduced, for practical purposes, to Zero due to the sealant properties of the foam. As such, we utilize our own heat calc program which factors in the Type of insulation in addition to the R-value to arrive at the home’s overall heat loss. After that, it is very simple- the heating unit must be able to generate at least this maximum heat loss rate per hour or it will not be able to heat the house adequately. For the A/C side, it gets a little trickier. If the A/C unit is oversized, then it will not run long enough to adequately remove the moisture from the air and the house will feel “clammy”. Your Water Furnace unit, with its two-stage capability, is ideally suited to address this issue. Cooling loads are much lower in the Northeast than Heating loads. So, your system can run on Stage 1 for cooling and perform quite efficiently while running long enough to eliminate humidity. You asked, “…what heating and A/C bills look like per square foot..?” Any number that I might give on a sq.ft. basis would be meaningless to most people. Computing what heat/cool costs should be with a Geo system is a complex calculation for which you need to (a) know the total heat loss of your home, (b) know the rate per Kilowatt of electricity from your local utility, ( c) know the efficiency rating of your Geo equipment, and (d) know what the ambient temperatures per season are for your region. A more simple way that I use is that it costs $1.17 for the typical water source heat pump to generate 138,000 BTU’s given a cost of electricity of $0.186 per Kilowatt. One gallon of Oil contains 138,000 BTU’s and costs (currently here in NH) $3.01. You can use these numbers, adjusted for your local costs of electricity and oil, to derive the cost benefit of heating with Geo for your area. The typical Geo system that we design and install takes 4 to 6 years to pay for itself completely. Green Talk, can you say more about your unit being “programed wrong”…we have just moved into a new house with Geo and we had a huge sticker shock with our first electric bill, it was twice what we expected. I believe our unit isn’t working correctly, we’ve had our installer return and he said our issue is “heat loss” due to fiberglass insulation vs. newer better types…we also have an unfinished basement (where the unit is located) and he suggested insulating that would help….any thoughts or suggestions from the group???? Please Help!! Country Boy, my units were programmed for well instead of the closed loop that I have. My new installer told me that this is why one of my units frooze up in the winter. Actually, some of my units are in an unconditioned space in the attic. After, my installer passed away, another dealer came to look at the units and told me they should be in a conditioned space to be more efficient. We are in the process of building an insulated closet around them. However, my bills are not that high. I wonder what else is going on. My house has icynene which means it is better insulated with the fiberglass but again, something sounds wrong. Country Boy, can you give me some more facts. Take a look at your electric bill. What are you paying for electricity, how large is your house, and how many killowatts did you use last month, what is the size of your unit or units. Is the loop closed, open, or well? Does the geo sound like it is always running? Do you have emergency heat backup on yours? Do you have more than one unit? My neighbor’s units were not hooked up so during the winter he was only running with 1/2 of his units on! His bill was absurd. 1. Manufacturer, Model No., Size (tons), and Type (water-to-water, water-to-air, combo) of Geo Unit? 2. Type of Geothermal Heat Source (Well, Horizontal Ground Loop, Open Loop, etc.)? 3. Square footage of your home that is heated? 4. Exterior wall thickness, type of insulation, and insulation thickness or R-value rating? 5. Attic insulation type and thickness or R-value rating? 6. Geographic location of your home? 7. Incoming and Outgoing Geo Loop temperatures, flow rates, pressures (any data that you have gauges for)? 8. Price you pay per Kilowatt Hour of electricity and the Demand Charge (if any) for electricity that you pay? 9. Who is your electric utility? 10. What type of back-up heat do you have (if any) and is it running? From the answers to these questions, I will have another set of in depth questions. Don’t worry; we will get to the bottom of this issue. Gary and Anna, thanks so much for offering to help me…I’ll gather all the info you requested and post again when I have it. I really appreciate the help!! Gary and Anna, I’ve tried to answer Gary’s questions the best I could..I had put my answers in “blue” text…but I’m not sure that will show up on the post…so I’ve repeated all of Gary’s questions – with my answers at the end of each question…thanks again…the latest is that we have an “expert” from the utility coming out in early Feb. to evaluate our house for “heat loss” and to try and help figure out our problem..thanks again. 6. Geographic location of your home? Northern Kentucky (near Cincinnati, Oh) FYI in Nov. we averaged high of 55 and low of 36, Dec. H of 44 L of 27, Jan (2007) was H of 39 L of 21. 7. Incoming and Outgoing Geo Loop temperatures, flow rates, pressures (any data that you have gauges for)?Not sure where to find out what the incoming/outgoing temps are, flow rates, etc…any direction on how to find this data? 8. Price you pay per Kilowatt Hour of electricity and the Demand Charge (if any) for electricity that you pay? I pay .0771986 per Kilowatt hour…however when you add in local taxes and an environmental surcharge it equals .0872384 per KW hr. For perspective our Dec avg KW/day was 127/day …our new bill for January shows that we are now using 97 kw/day…I had a phone call with the local utility company and they told us they would expect a house our size to be between 70-80 kw/day. 10. What type of back-up heat do you have (if any) and is it running? The back up electric heat that came with the Geo unit , is the only back up heat we have. It has ran several times over the last several weeks- but we haven’t tracked exactly how much it’s been on. It looks like your installer’s comment about being under insulated is correct. The R-19 under the dormer should be doubled and your R-13 walls should be at least R-19. With fiberglas, you will have lots of air infiltration which is a huge source of heat loss. And if you have no insulation between your unheated basement and your 1st floor, that is also costing you money. This should be at least R-19. The R-38 in the attic is fine, but you should check for gaps or places where the insulation is not full depth. I forgot to ask about your windows and doors. Who is the manufacturer and do you know the U-value for them? Basically, you need to find any location where air is coming in (walk around with a lit candle and see if the flame is being blown to the side near any exterior walls- careful not to set anything on fire!!). These drafts need to be stopped. Since you are heating 2,700 sq.ft., it seems that your 4-ton unit is undersized, especially given your insulation R-values. I would have put in at least a 5-ton unit, but you are in a much warmer climate than me, so I’d have to do an energy calc to find out what it should be. In any case, there is no way that 4-ton unit would be able to handle the additional load of heating your basement of 1,800 sq.ft. By the way, how is it that your basement is 1,800 sq.ft. and your 1st & 2nd floor together are only 2,700 sq.ft.? Is the 2nd floor over only part of the home? Please give me a breakdown of sq.ft. for 1st and 2nd floor. As for temperatures in and out of your loops, your system should have Pressure/Temperature gauges on the incoming and outgoing loop lines. If not, you should have some installed. We typically use Winters Tridicator Pressure/Temp gauges (you can get them from Grainger on line- http://www.grainger.com/ ), or you might use the ones that just attach to the outside of the pipe (don’t require any plumbing). At first glance, it appears that your heat pump, due to its size, cannot keep up with the demand in your home, so it kicks into electric resistance backup to make up the difference. The cost of electric resistance heating is AT LEAST 3 TIMES as expensive as the Geo system, maybe 5 times as expensive. To test this, you could disconnect your backup heat for a month and see what happens, both in terms of how warm your house is and in terms of the resulting electric bill. If you disconnect the backup heat and the Geo system on its own cannot bring the house up to the temperature that you’ve set on the thermostat, then you have your answer- it is too small and/or your loop is too small. When you give me the additional information that I’ve asked for (including loop temps), I will run an energy analysis and tell you what size the unit should be. Remember we had this discussion about why I have electric backup? I could not understand why you were asking me about loop size since I knew that my installer installed the loop 300 plus feet in the ground. So, I asked the new company who is providing maintenance for me why I have electric back-up. He put the pieces together for me. He explained that the actually loop size has to be certain size or you will have to have back-up since the system will not be able to handle the load at given temperature times. Apparently (and we can’t confirm this because my installer passed away) some installers may put in a smaller loop to save money and put in electric back-up so in those occassion days when the temperature really dips, the electric is there to help. My new company uses the rule of thumb for 350 feet per ton in NJ area. My manufacturer (according to the company) mininum for the loop is 250 per ton. My installer may have thought it is not worth the added cost for those rare cold days. Gary-did I understand this right? Also, what do you think the minium loop length should be in the northeast and how much does it vary through the country? What basically was the cost savings passed onto me with a shorter loop and installed electric backup? To undersize a loop to save money is pure stupidity! The Geo system saves money in operation and this is forever, so why would you want to limit the Geo system’s function by making the loop small? Wow!! If you are talking about a Closed Loop with a circulator pump, then I usually size these to be 200′ of bore hole depth per ton. So, if you have a 4-ton system, your total loop depth should be 800′. We like to have the loop bore hole to be between 200′ and 300′ deep, so you would have (for 800′ total) 4 bore holes 200′ deep. The loop lines run from the supply manifold, down to the bottom of the bore hole, make a “U-bend”, and come back up to the return manifold, each being a “home run”. So, in this case, you would have 1,600′ of pipe in the bore holes plus the distance from the house to the holes and back. If the vertical loop is a Standing Column design, you need only 100′ per ton. So, for a 4-ton system, we would drill one well 400′ deep (plus a little extra to collect sediment at the bottom). A variable speed pump is placed inside of a “shroud” (4″ PVC pipe sleeve) and lowered into the well to at least 50′ below the static level of the well water. The well water is pumped from the bottom of the well (the PVC shroud acts like a big drinking straw for the pump) into the house, through the heat pump, and back out where it returns to the top of the well just below the static level. These rules are pretty much the same for the entire country, although there are other issues to consider if you are in the Southwest desert area. Your cost savings for a shorter loop than is recommended is about $17/Foot of bore hole depth for the difference between what you actually installed and my rules above. So, if your system needed 800′ and you only installed 400′, you would save $6,800 on the initial installation cost. In our systems, we rarely if ever put in the backup heat which also costs money to install; around $1,500 for 10Kw 3 phase. So this reduces your extra loop initial cost from $6,800 to $5,300. For a 2,000 sq.ft. house (well insulated), the Geo system would cost approximately $7.00/Day (when it is 0°F to 5°F outside) to operate if your electricity costs $0.215/KwH. The electric resistance backup costs at least 3 times and possibly 5 times as much to operate. If we use 4 times as much, then it is costing $21.00/day extra to operate using backup heat. Your initial install cost of $5,300 would pay for itself in 252 days of operation at 0°F to 5°F. You need to find out how many days/nights per year your area falls to this temp to determine how many years it would take for payback. If your backup heat kicks on as soon as it hits 20°F, then there are a lot more days per year to add into this equation, but at a lower factor since the backup it only supplying part of the heat at these temps. So if we say it costs 2 times as much to operate when it is between 6°F to 20°F, then you have an extra cost of at least $7/Day. For here in NH, this extra cost would pay for itself in 5 to 7 years. If you are in a warmer climate than NH, it might take 10 years. If your electric rates a lower than $0.215/KwH, then Divide $7.00 by $0.215/KwH and Multiply that result by your electric rate to get your base cost of operation per day. For example, Country Boy states that he pays only $0.0872/KwH, but his home is 2,700 sq.ft. So, he would need 5 tons (instead of 4) or 20% more energy per day, but it costs him a lot less. His cost per day should be ($7.00 / $0.215) * $0.0872 * 1.20 = $3.41/Day at 0°F to 5°F and less on warmer days. Therefore, the answer to your question, Anna, about the savings you realized with the shorter loop depends upon how you look at it. If you look at a 10 year or longer picture, you are losing money. If you look at a 1 year picture, you saved about $5,000 by installing a short loop. Gary-We are just trying to figure out why I would have electric heat back-up if we did not need it. Unfortuneately, since we can’t ask anyone, we can either assume the loop is at the minium amount or we were sold something we did not need. We were told the electric heat would go on around 10-20 degrees but it has only gone on a couple times when there was a problem with the geo. It is SO expensive when that happens. As Country Boy knows as well. It is also expensive when the unit never shuts off too. I suspect we were sold electric back-up when we did not need it. I asked my new company about your suggestion about putting a switch on the electric and they said they could do it. As for savings, I was just wondering if my installer installed a shorter loop to cut corners, if in fact he did. I had no idea. He never gave us options. He just gave a price for the “perfect” system. If he said you needed “X” I would have said okay since he came highly reccommended. You are one of the first people who have really explained things to me. What I learned is get at least 2 quotes! You asked if a red flag should go up if a Geo installer starts talking about electric backup heat. As usual, I don’t have a simple answer. Electric backup heat was very necessary with the old Air-to-Air heat pumps. Guys that sold these piece of junk (for the Northeast) systems who are now in Geo are quite likely to still think you need this backup. Does the oil or gas heating system guy tell you that you need a backup system? No. Modern Geo systems that are well designed and installed correctly do not either. So, the fundamental answer to your question is YES, if the installer insists on backup electric heat for a Geo system and says you need it when it goes below 20°F, RUN AWAY FROM THIS PERSON!! They don’t know what they are talking about. I read your comments with interest. I recently installed a Geo system when my old heat pump died. Because of the failure I did not have as much time as I would have liked to do my research but I did interview four suppliers in the local area. Generally I was very disapointed with their knowledge. Anyway I choose the best of the bunch and the installation went pretty well (due mostly to the input of the one knowledgable lead guy.) and I have been very satisfied with the installed system. They did install the backup heat but thankfully with the worst part of winter over in Southern PA I can say it only ever turned on for short periods 2-3 days during the seasons so overall I would say the Unit is sized OK though reading your comnments Gary I have to say the idea of the bigger loop has some merit even further south. Last week the installation company came and gave the system a check up six months after installation. They did the check when I was at work so I could not talk to the technician but they wrote down a few numbers on the service report, two of which were the water in and out pressures in the ground loop (Closed vertical type) which grabbed my attention. The pressure on the inlet was 28 psi and the outlet Pressure was 20 psi. Initially the large pressure drop stuck me so I looked up the manual for the Unit I have and it said the winter pressure in the loop should have been 50-75psi rande and the optimum pressure drop should have been in the 2-3 psi range. Needless to say the answe I got from the Service Department Manager has been less than satisfactory to date. So Gary you mentioned having P & T guages on the lines which seams inherantly a good idea. I could not find the gauges you mentioned that clipped to the outside of the lines. Could you provide me with a more specific link. Further in your experiance what would you like to see the ground loop inlet pressure at? Also what is the effect in running the system at reduced pressure? Is it reduced flow through the system with less heat transfer etc? Any insight you can share would be appreciated. For a closed vertical loop Geo system, the pressure is not important. The water Temperature incoming (from the field) and the Flow Rate are what is important. The average closed loop that we install (4 ton system) will run around 20 PSI with a 12 GPM flow rate. The pressure drop you mention is not unusual. I don’t know why your Owner’s Manual states that you should be running 50-75 PSI. That would require a hell of a pump to power that. What kind of equipment (and tonnage) do you have? The “clip on” gauge that I was talking about is (for example) from Stadler-Viega and is a Temp only type of gauge that has a built in clip to attach it to a copper pipe. It is not very accurate and costs more than the Winters, but you don’t have to do any plumbing. The manufacturer should specify in the Manual what flow rate the unit requires, typically different flow rates depending upon incoming temp. Your system may be a little more efficient at a higher flow rate than a lower one, but in no case should the flow rate be less than the recommended minimum rate. Higher flow rates require more pump energy, so the slight efficiency gain on the heat pump is offset somewhat by the pump losses. A lot of heat pump installers do not put gauges or flow meters on their systems because (a) they don’t want the homeowner calling them every two seconds because the readings have changed, and (b) they want you to be dependent upon them so they can charge for service calls. We put gauges and/or flow meters on all of our systems so that if a homeowner calls with a question, we can troubleshoot what is going on with the system by having the customer tell us what these gauges are reading. For us, the more “informed” the customer becomes, the better it is for everyone. So, if you have backup resistance heating, you can wait a day or so and not have to pay premium service rates to fix your system right away. Although we point this out to all of our customers, only 1 has ever added the backup to their system. It seems that the extra $1,500 or so to put it in is something most people don’t want to pay. Gary-I meant that if you system is built correctly, you should not need back-up. Isn’t that what you explained to me? You make an excellent point about having one in case one of your geos are down. What would preminium service cost? Would running the backup be very expensive? Do your suggest getting service contracts for your system? Anna- Yes, if your system is designed and installed correctly, then you should not need a backup heat system. But even the best systems can have minor problems that cause the heat pump to not operate. Events like this always seem to happen late at night on a Holiday, and if you are without heat and elected not to install a backup system, you need to get it fixed right away. Service calls for late night/holidays can be double-time over their normal rate. So, if your service tech normally charges $90/hr., and you have them there on Christmas Eve for 3 hours, you will pay $540 at double-time rates. If the backup heat would have originally cost $1,500 you would have to have 3 such Holiday disasters for the backup heat to pay for itself. Since a well designed Geo system is very reliable (as reliable as any fossil fuel system), then the likelihood of such a scenario is very low. This is why so many people elect not to install the backup resistance heating which is at least 4 times more costly to operate than the normal Geo system. Once again, remember that fossil fuel systems also have problems from time to time and need emergency service calls. And who ever heard of being required to have backup heat for a fossil fuel system? It is the same with Geo, but since Geo is new to most people, they feel more comfortable having a backup. As for temperature issues, Standing Column designs that use reqular well water to get their heat can start having freezing problems in the heat exchanger coil when the water from the well comes in at below 38°F to 40°F, depending upon the heat pump. This is because the heat pump can drop the water temp to below freezing in the coil as it extracts its heat. Obviously, this would cause ice buildup on the inside of the coil and eventually block the coil’s water flow. The unit safety mechanism will “kick out” the compressor if the water flow drops too low to protect itself from damage. The ice melts, the flow starts back up, and the unit resumes operation after a reset. On Closed Loop systems, vertical or horizontal, Glycol (food grade anti-freeze) is added to the water circulating in the loop so that the solution will not freeze until a much lower temp (typically 0° to 15°F). This is determined by the percentage of glycol in the loop done at time of installation. Geo systems that are used to make ice (ice rink or restaurant ice maker or walk in freezer) do not require a colder source (as commonly believed). The extreme low temperatures (-10° to -30°F) are achieved solely through the configuration of the compressor’s refrigeration system. There is no maintenance required on the loops, if that is what you are asking with respect to preventing problems. If the system is installed correctly in the first place, then there is nothing to worry about. If it was not installed correctly, then it needs to be fixed by a professional Geo person. 1) Is a geo-thermal system better economically and/or environmentally than a natural gas/forced hot water system? If so, by how much? 2) Apparently much of Lexington is on ledge,and I’ve been warned that drilling into it is difficult. Gary, you state that you drill in NH, which I’m guessing is even worse than Lexington, so is this fear unwarranted? 3) Would I need to get town approvals to drill? That’s all I can think of currently. Thanks in advance for any replies/comments! Geothermal Energy is much, much more “green” than any kind of fossil fuel. And the more that the Country (and World) implement renewable energy sources (i.e.- wind power, solar-photovoltaic, hydroelectric, nuclear, etc. ), the more environmentally friendly it becomes due to the fact that all of these renewable energy sources generate electricity, and electricity is what powers a Geo system. To use a fossil fuel for heating, you must burn it. This generates Carbon Dioxide which, if you’ve been noticing the global climate changes, is killing our planet. Although over 40% of the electricity generated in the USA today comes from fossil fuel fired plants, this will continue to drop as we progress. The production of natural gas also has a large carbon footprint for its production and, in its actual use by your furnace, has a HUGE carbon footprint from the exhaust gases. In contrast, a Geo system has no carbon footprint from its production of heat since there is no combustion. It is my opinion that if everyone switched to Geo tomorrow, we could avoid the impending disaster from global warming. As for drilling, any good well driller in New England is equipped for and experienced with drilling in rock. I can recommend one for you if you’d like. You do need a permit to drill a well in MA. Your well driller will obtain this permit for you. You will also have to obtain a permit from the Mass Department of Environmental Protection, UIC Division, in order to install and operate a Geo well. This is not a big deal and if your well driller and Geo system designer are experienced (as they need to be), then they will get this permit for you. I might suggest that your best first investment would be to get your house into shape with respect to insulation. Your highest and fastest cost-rate of return is going to be from improved insulation. Ideally, you can insulate your home and install the Geo system at the same time. Thanks Gary, I learned a lot from your response, and your comment about fully insulating my house is duly noted – I’ve contacted a consultant about an audit! One follow-up question comes to mind: Isn’t electricity needed to run the pump in a geo-thermal installation, and thus fossil fuels are needed to generate that electricity? Does that add up to anything substantial, and is there a chance it negates the ecological gains from not using natural gas? As I stated in my initial response, yes, over 40% of the electricity generated in the USA today comes from fossil fuel fired plants. So a Geo system using electricity does have a carbon footprint from these types of power plants. However, there is also a carbon footprint caused by the production of natural gas. It may not be as large as the carbon footprint from the power plants using fossil fuel, but these plants are slowly going away as alternative power generation sources (wind, solar, etc.) come on line. In the not too distant future, all electricity will be generated by renewable energy sources. This is a simple fact based upon reality that the fossil fuel supplies are running out (although coal will be around for at least another 100 years) and, at the same time, becoming too expensive to use. In any case, the Carbon Dioxide generated by the power plants to make electricity is minimal in comparison to the CO2 generated by burning natural gas (or oil or propane) in homes for heating. Primarily this is due to the fact that the power plants have huge scrubbers and other air quality control systems in place (to meet Federal standards), whereas your home has nothing of the sort. So, there is no chance that a Geo system which burns nothing can be compared ecologically to a fossil fuel heating system. I am in georgia and planning on installing a 2 ton system where the load calc called for a 3 to 4 ton system. My installer is incredibly knowledgeable and I did get other bids. I am the one who wants to undersize it and my installer said it would work. We rarely get temperatures below 20 degrees here. I plan on using pull down window insulation on cold nights. I think that the added environmental impact and financial cost of all that extra drilling and piping is unnecessary for some people. My attitude is save the money on installation and put the effort in to doing other things to deal with the occasional very cold or hot day. Obviously this is a strategy that may not work well up north. Down here you can pretty much get by with no heating or cooling at all like in the good old days. My house is passive solar and its sunny down here a lot. My dad’s house can get pretty warm just from the sun and it lasts most of the night. I think it may be unrealistic to imagine that everyone will have $30,000 to create a massive geothermal system. We have to look at minimalist systems and then not be lazy about dealing with those extreme days. Of course, if you have the money and live up north and don’t want to stick insulation on your windows on cold winter nights or superinsulate, or throw on the down comforter, then by all means it is very much worthwhile to install a big system. Hello, I live in Cumberland, Maine and had a geothermal system installed about 1.5 years ago. I’ve had problems ever since and have had electric bills as high as $1200 in the coldest month. The lowest I’ve seen is $270. We’re quite frustrated and hoping someone might have some ideas to give me direction. I have a 4000sf house and 1200sf finished basement which I have a zone but rarely heat. I have 2 – 5 ton climate master Genesis units (Model GSW060). One is a typical one with airhandler in the basement and services the first floor and basement. The other is a split system with the exchanger in the basement and the air handler in the attic (in an insulated room). The duct work is in the attic unfortunately. It has the typical insulation but I think it needs to be redone and sealed properly. I have 2 inches of foam insulation sprayed in the 6” walls and R13 on top of that. The ceiling of the basement is insulated. I was told I have R50 in the attic, but I think it’s more like R38. I have jeld wen windows and doors which have a U value of .35 or less and a design pressure rating of DP50. I do have some drafts in the windows which may be an installation issue and I’ve put a claim into jeld wen. Someone should be coming soon to evaluate that. I have 9 foot ceilings and lots of windows, it was estimated that I have a 10 ton heat load. I have an open loop system with two 435 foot wells. The wells produce 30 and 40gpm. One of the wells also services domestic water. I have franklin cp75 constant pressure well pumps. The pressures on both were set at 60 psi. However, I asked the installer what pressure I need to maintain the 15gpm recommended thru each unit and he stated 20 psi. So I turned down the psi on one of the pumps that doesn’t also service domestic water to 35psi, but that didn’t seem to make much difference. The water temperature in the 2 wells run between 43 and 48 in the winter and around 50 in the summer. Initially, the backup electrical heating was kicking in during cold days since it was taking some time for the geothermal to meet the demands of the thermostat. That was during the first winter, and since then I’ve turned the circuit breakers off to the electrical emergency heat and had the installer change out the thermostats. The difference between the incoming and outgoing temperature from and to the wells is about 3-4 degrees, which seems low to me, but I wanted to check on that. Both units are set up to bleed 10% of the water when the well temperature drops below 47 degrees in the heating mode and above 52 degrees in the cooling mode. I don’t have pressure gauges on incoming and outgoing water, and the only flow meter is for the bleed. Both wells share one bleed line, which also seems a little strange, since they run independently and there is just one taco valve that they are both electrically wired to. The bleed line is a copper tube going into my foundation drain thru the concrete floor in the basement. The tubing is copper and mostly 1” diameter, although stepped down in some areas. One of the major problems has been related to water quality. We have high levels of iron and manganese. We have also been plagued with iron bacteria which has caused the taco valves to clog requiring over $2000 in replacement repairs. I have to filter my domestic water, but it’s cost prohibitive to try filtering the water for the geothermal units at the required flow rates. I’ve hired a forensic engineer to evaluate the system and he hasn’t gotten back to me yet on his recommendations. He initially mentioned putting both units in one well and keeping the domestic on it’s own well which makes some sense. However, to keep the same well depth, the bleed would need to be considerably higher and I can’t bleed that much around my foundation. That still doesn’t solve my water quality issues. I asked about converting to a closed loop system and he thought it would cost about $28,000 off the top of his head to make that conversion. I’m ready to scrap the whole thing, and change to propane boilers, which would be a lot less hassle. Although I would lose the air conditioning, and lose out on the large investment I made for this supposed high efficient system. Hallo! Great! Will come here more often :). Thanks for the help :o, Peyo. Sorry that I did not respond to this sooner. I just saw it for the first time today. Anyway, your system is too complex for me to accurately analyze in this forum. The main question that I have is regarding your Geo wells. You state that you have “an open loop”. What kind of open loop? Are you pulling water from the bottom of the well and returning it to the top? (Standing Column open loop) If so, do you have a shroud in the wells? In your case, I would be pulling all of the Geo source water and your domestic water from the 40 GPM well, and returning the Geo water to the 30 GPM well. This would eliminate the need for a bleed completely and would eliminate one well pump. As for your electric bills, I don’t know what your rates are in your area, but if you follow the equations below you should be able to calculate what it should be costing you. I don’t know about Climatemaster, but a Hydron Module H062 (5-ton dual capacity GSHP) with no desuperheater and with 50°F source water (@ 11.7 GPM) would generate 65,100 BTU/Hr and use 4.73 KW of electricity (including pumping penalties) to make that heat. So, adding these two figures together, you could have an electric bill of $1,100 if your rate is $0136/KW. But it would have to have been Zero outside for the entire month for this to happen. I don’t know exactly where Cumberland is, but I doubt that it is that cold. Finally, a closed loop configuration is MUCH less efficient than an open loop Geo system. This is because of the poor heat transfer capability of the closed loop system. This is NOT the answer to fix your system. Regarding your comment that the system cannnot come up to temperature fast enough and the backup heat kicked in, you should add an outdoor temperature sensor to your system to eliminate this issue. I would be very interested to know what your forensic engineer came up with. We have just purchased a home with a Water Furnace premier series closed looped geothermal system. Our low pressure light is blinking red on the unit itself, and our aux heat light is lit on our thermostat. Any information as to why the low pressure light is on, and is this why the aux heat keeps coming on? Thanks, any advvie would be appreciated. It does not stay in aux, the aux kicks in when there is a 3 degree or more drop in room temp. Is it kicking in because there is low refrigerant and is not working at it’s capable capacity? Let us know what your installer says. Thanks for all of the advice! I managed to find the paperwork from the owner stashed in a drawer of the kitchen and came acroos the installers name and then placed a service call. The lack of refrigerant in the lines made the compressor freeze up therfore the unit was not operating at all. The installers conclusion was that there was no leak in the unit, it probably was a result from the unit sittin for 2 plus years. So we got outwith a small charge and an fully operational unit. We are now warm and happy! Geothermal is a fantastic source and method of heating energy. The deeper in the ground you can go; preferably to the mantal energy will be maintain at slow release heat and will provide adequate heating for the average home. The water can also be recycled and eventually be used for your garden, toilet and other uses around the home. The type of Geothermal that is being discussed is “Earth Coupled” or “Cold Geothermal”; not the high temperature volcanic driven Geo that you are mentioning. The depth of the Earth’s Upper Mantle is approximately 30 miles and it is comprised of molten rock at temperatures over 4,000°F; so it is not a “slow release heat” as you suggest. It is also inaccessible except for volcanic hot spots (i.e.- Yellowstone, Iceland, Hawaii, etc.) where the Earth’s Crust is thinner and the high pressures below force the molten rock to the surface. While volcanic Geo is great for heating, it is not available to most people on the planet and is also very, very dangerous to deal with. Geothermal can also be placed underground for optimum efficiency. This is particularly true for areas with cold winters and warm summers. Steve, I saw one of the DX systems at a building fair. I remember talking to my NJ installer. I think they are not permitted in NJ. I forget why. Tell me more about these systems. By the way, my understanding from Gary who frequents the site is you don’t need back-up for a properly designed geo-thermal system. He explained that it is advisable in case the system goes down and you are waiting for repairs. Yes, I have just read it. DX systems have their merits. Instead of using water to transfer earth energy into the heat pump, a DX system uses Freon. Typically this Freon is contained inside of a copper tube which is run into a bore hole in the earth much the same as a vertical closed loop water-based Geo system. When the Freon is allowed to expand inside the copper tubing in the earth bore hole, it converts from a liquid to a gas and this phase change absorbs a lot of heat from the earth. Inside the heat pump (in the house), the compressor compresses this gas back into a liquid and it becomes very hot (about 170°F). This hot liquid is run through a heat exchanger that (in a forced hot air system) blows this heat into the home and heats it. The liquid freon, now much colder, is pumped back into the earth and the process is repeated. As Steve mentioned, efficiencies on a DX system can be very high due to (a) the high heat transfer rate between the copper tubing-expanding Freon and the surrounding earth (or rock), and (b) the lack of need for a big pump to move water in and out of the earth. Also, the size of the bore hole can be much smaller diameter. But it is very hard to drill solid rock (i.e.- NH granite) with a small diameter drill. The issue with DX has always been the fact that copper tubing is VERY susceptible to puncture, corrosion, and other failure issues. Of course, when failure occurs (when, not if), all of your Freon is lost into the earth and/or the aquifer. Although the latest Freon gases are friendly to the ozone layer, they are still poisonous and toxic to the ground and ground water if released. This is the reason that I have never designed or installed a DX system. However, the DES of Massachusetts began a DX system test a couple years ago. The data on its performance is not complete yet. It will take many years to adequately test the system. Based upon DX systems I am familiar with (I replace them), the copper fails within 10 years or so from simple corrosion. In comparison, the HDPE pipe used for water-based systems is guaranteed for 50+ years and has an effective lifespan of “forever” since nothing corrodes it and it does not decompose. I am watching these developments closely and hope that the testing goes well as it will be of great benefit to Geo everywhere. we have been looking at lots of info on types, brands,installers etc. what we find is answers all over the place, like only 1 out of 10 people sound like they know what they are talking about, and we seem to get generic answers with not much technical explanations as to why a particular system, sizes, materials, loop types VS savings, lower operating costs …..not to many solid answers. We have been told we can save a lot of money by hiring a backhoe to drop our own slinky loop in and running it all into the basement before they pour the foundation, then by running our own radiant floor tubes, and ductwork, then we would just need to pay for the unit it’self and the hook into the house.. So far the hydron system looks to have the most promise. we seem to have wet clay about 6-7 feet down, and are wonding if this type of dirt is better or worse to aid the efficiency. we are also thinking of supplimenting the hot water or combining it with solar hot water.. We also are building a Yankee Barn Home ( from NH) which have a really high energy savings to begin with, but will be making a floor plan with an open great room with an opening to the 2nd and 3rd floor loft to the 20ft ceilings and figure our Pellet stove at the edge of that opening will give a quicker burst of heat when we need it. For us it’s all about running the cheapest sourse of heat all the time. do they make a hydron system that will feed hot water, run radiant floor loops, blow hot air, feed a handler, and run an ac ducting system ? will such a unit be to expensive ? can just the cost of the unit be under 10K ? just wanted to mention we are building in woburm ma. and will likely be contacting someone from hydron to assist us with a smart geo system that we can work with, one of the hurdles we face with a modern post and beam home is no attic space, and running anything in the outside walls and past the 10 inch thick beams. the house in mention is going to be 2500 sqft.. we have no idea on Tons ? feet of ground loop ? best type of pump ? size of the pex lines. we do have and know our pellet stove costs $4.00 for 20 hours of continous heat at 35,000btu’s . so not sure which system will be doing the supplimenting since we heard the horizontal loops don’t save as much,,, how much is not as much ? I’ve done many post and beam constructions; from design through final construction, both residential and commercial. From my point of view, they are the most cost effective way to build. The lack of attic is not an issue at all. Just a quick question. Are you committed to Yankee? If not, then you would do yourself a favor to have the guys from New Energy Works (www.newenergyworks.com) give you a quote. You should be pleasantly surprised. For 2,500 sq.ft., you will need approximately 5 tons. I do not recommend closed horizontal loop for anywhere in the Northeast. Not unless you can put the loop field down 12′ like they do out in the Midwest. (They just take a D9 bulldozer, rip open a football field sized hole 12′ deep, fill it with slinky, and backfill.) In Mass where frost goes down 3′, you have a max of 32°F at roughly 42″ down and it picks up about a little over a degree per foot thereafter. At 12′ down, you have about 42°F max. (in the middle of Winter), and that is all your Geo system has to draw heat from. Horizontal loop systems are designed to operate at sub-freezing temps (with antifreeze) and your loop field is lucky to be at 32°F by the time Spring rolls around. In constrast, a vertical closed loop is operating with a pretty constant 50°F in Woburn at that time of year. And the heat transfer coeficient of the rock (ability to recover from cold buildup) is many times better than the clay that you are talking about. And due to water flow in the rock, your vertical loop will be (at worst) about 42°F in the Spring. So you can see the efficiency differential right there. And of course, open loop systems, which I prefer, are even more efficient since they always have 50°F+ as a source. As for combining radiant with forced hot air, we do it all the time. It’s kind of my specialty. The Hydron equipment handles this easily, and we also manufacture custom low temp super efficiency fan coils to work in conjunction with such combo systems. As for comparison, the typical Geo system is estimated to cost $0.87 for 138,000 BTUs using the Woburn electric rates. (138,000 BTU is equivalent to 1 gallon of oil burned at 100% efficiency.) You can look up on the internet what it costs to generate this same heat with pellets, but be careful to differentiate between the heat delivered into your home from the pellets and not just the BTUs of energy contained in the pellets. I can tell you that Geo is more efficient AND it is green. “create a thermal break between the edge of the slab and the foundation wall.” How would you do this? It is easier to show on a drawing than to explain. I can upload some examples if you would like. Just let me know. Please note that all of the following comments refer to concrete slab floor on grade construction. The common recommendation in engineering and building code specs is to run insulation vertically on the outside of the foundation wall. Our studies have shown that this does not work at all for a variety of reasons, least of which is that the insulation is penetrated by water and rendered useless. The problem with this is that the edge of the concrete slab (typically 4″ thick or so) meets the inside face of the foundation wall with no insulation between the slab and the foundation wall. To make matters worse, if the slab is at grade, then the outside face of the foundation on the opposite side of where the slab intersects is exposed directly to the elements. If you look at almost any building, you will see a surface of about 4″ (or more in residential) of the concrete foundation that is exposed. This results in a direct heat transfer through the concrete (which has a low insulation value and transmits heat very easily) to the outside with no insulation to stop the loss. I’ve seen buildings where the inside perimeter of the floor is literally frosted with ice from the heat loss on very cold days with high wind chills. We solve this by simply extending the vertical 2″ insulation all the way to the top of the foundation wall. The slab butts up against this 2″ thick foam and has no contact with the outside foundation wall. This is called a “thermal break”, but is really more than that since it gives a full R10 of insulation where there commonly is none. In other words, the architectural design has to work with the mechanical design to achieve a satisfactory finish around the inside floor perimeter without compromising the insulation (thermal break) value. The energy benefits of this a very significant. Another aspect of this is that we always insulate under the entire slab, and do it with two layers of 2″ foam (R20 in total). This saves a HUGE amount of heat loss for the building that is almost always overlooked by architects and engineers. It is commonly assumed that the earth under the slab becomes warmed by the building and, therefore, is not losing heat after it warms up. This is totally wrong. As was discussed previously, the earth (in Winter) is only about 42°F at a depth of 12′, 38°F at 8′, and only about 32°F at 4′ here in the Northeast. Even after the ground temperature warms and “stabilizes” (as it is commonly referred to) under the slab, it will still only be 45-50°F at best. Think of the millions of square feet of slab floors that are not properly insulated. Stores in malls, grocery stores, and schools, just to name a few building types, lose Billions of BTUs per hour across the USA because they are typically not properly insulated. Anyway, my point is that people are often so concerned with the heat loss through the attic/roof, the walls, and windows/doors that they overlook other major sources of heat loss. Even worse is the fact that the “accepted practice” in construction is to have only limited perimeter only insulation for a slab. You would not believe the arguments that I’ve had with contractors trying to get them to install the insulation and slab in accord with my drawings. It is like getting a horse to climb a rope. I hope that this answers your question clearly. Gary, would love some drawings. Can you send them to me? I should do a Q and A with you for the site on slab insulation. I have R-10 under my slab. Is the R-20 for all regions? Happy Holidays!! Thanks for the compliment, but I owe it to my Dad, my 7 Uncles, and both Grandfathers who all worked in different trades and took the time to teach me. This helped make my architectural and engineering schooling all make more sense and taught me far beyond what the books alone could do. R-10 under your slab is great! Sure, R-20 has twice the insulating value over R-10, but R-10 has over 32 times the insulating value over just plain concrete!! Insulation is important for ALL regions, but the value of a particular amount of insulation can best be determined from an engineering analysis. The temperature of the groundwater for any area is roughly equal to the annual average temperature for that region, and the earth under a slab or foundation follows a similar pattern. For example, if you are in Humacao, Puerto Rico, with an annual average temp of about 78°F (the groundwater is this same temp), you need air conditioning almost all of the time (mostly for dehumidification). If you want it to be 70°F inside, this is only 8°F colder (on average) than the earth under the slab. So R-10 insulation would be great, but going to R-20 would not be cost justified. Doing this type of analysis is the way to determine insulation values for any region. Hi everyone — We put in a 4 ton geo system last sept . Byant /Climatemaster – forced air unit– 4 loops in the yard at 6\’ deep – all at 600 foot per loop 300 out & in. That cost 4,400 all done hooked up /filled & purge / test run –all done ! nice work too — the geo unit we bought from the dealer & my 20 year old installed it — our duck work was all new from a remodel 2 years early – getting ready for it !! We did all elec. work too. This is a log home with 8\” logs – We sprayed foamed the roof trusses from the outside to seal all gaps then we put on a metal roof the foam was like 1-2 \” thick & reinstalled the 8\” pink insaltion. & triple paine windows too– The home is on the state line of Ohio /Mi – West of Toledo /Oh Cold yes— hot yes — The elec bill is for all lights geo- 3 kids all the toys !! Pc\’s tv\”s — & a shop for me !! Our elec bill is winter $ 280.00 biggest winter /summer like 180.00 — just asking is this the normal bills ? Temps in our home winter 72 – summer 72 — LOVE IT !!!! Oh ya & our total cost was 13,100 turned on !!! Great job on the Geo install! We love to work with homeowners who want to do as much of the installation themselves as possible. This way, they know first hand what the system is doing and why, and they save a lot of money on the system. Ohio in your area (just West of Toledo) has similar frost depths to us in the Northeast. You might run into some problems in a really cold Winter with the loop field being only 6′ deep. But if you made it big enough, and you air condition in the Summer, you could be just fine. As for your costs, if you let me know what you pay per Kwh for electricity and if you have a demand charge or not, I could tell you how much it should cost. I keep my house at 70-72°F year around, too. My wife is from Iceland and is used to toasty floors (radiant heat). So we keep it fairly warm. I am building a new home in northwest New Jersey. Can you give me the name of some knowlegeable and reputable installers for a geothermal system? What town/city exactly? I know some guys on Long Island, NY, and another in NJ, but knowing what area you are in exactly would make all the difference. The house will be in White township (Warren County) New Jersey, approximately 20 miles east of the Pennsylvania border. Anna, thanks for your input as well. Anna is from the area, so I would always go with what she says. But I do have a good friend and excellent installer in Branchburg, NJ. His name is Ron Anastasi. I’m just about to purchase a house here in Pittsburgh, PA, and I’m thinking of installing geo as part of my mortgage. My house is 80 years old and is not well insulated. I’ll be doing an audit later this week and will find out exactly how inefficient it currently is. The house is 1200 sq feet total. That’s 600 for the first floor, 600 for the second floor. I have a basement which is another 600, and will also be converting my attic to a loft space (not included in the sq ft calculations). 1) How big of a unit might I need for this sized house in my region? 2) How much electric can I expect this unit to consume in the cold months here? 3) Do either of you have an installer in the Western PA region that you could recommend? Yes, Anna is awesome; I’m just the engineer. Your best bang for the buck is ALWAYS insulation, insulation, and more insulation. The biggest problem with any home, and especially older homes, is air infiltration. It typically represents at least 40% of the overall energy loss for any house that is not properly insulated, and more if there are single pane windows and doors without weather stripping. It is like leaving a window open. This is why I always recommend sprayed in place rigid polyurethane foam (also called “high density” foam) for all homes and, again, especially for older homes. Even if you have a tight budget, you can spray an inch or two of foam on the inside sheathing of all exterior walls (you have to remove the inner lath/plaster or gypsum board first, obviously), and then fill the cavity with fiberglas. You also need to foam around the frame of all windows and doors. The foam will kill the air infiltration, and make the house nice and tight. The roof/attic insulation method will vary on the structure design. You say you want a loft in the attic, so I would suggest that you insulate the underside of the sheathing with spray in place rigid polyurethane foam to at least R-38 since 70% of the heat loss (other than air infiltration) is lost through the roof/attic. At R-7 per inch, the rigid foam would need to be at least 5.5″ thick to hit this value. If the rafters are 2×6’s, then this will work perfectly. Here you do NOT want to go with the foam/fiberglas combo as moisture in the air will condense on the underside of the foam and soak the fiberglas and your drywall. If you insulate to at least R-38 for the roof/attic and R-21 for the side walls (basement walls included), then you will need a Geo system of about 3-tons. I don’t know what your electric rates are in that area, but I can give you some numbers for other homes for which I’ve designed the Geo. The one that comes to mind is a home in Rochester, NY, of about 2,200 sq. ft.; a little larger than the home you have, but it is a ranch so the heat losses would be comparable. He first installed a Hydron Module 4-ton unit in 1980 and it ran perfectly (without any service calls) through 2009 when we replaced it with a new, more efficient Hydron Module 5-ton unit. (He is planning an addition, hence the extra ton.) He sold the 28-year old Hydron unit on Craig’s List to a guy who uses it to heat and cool his hunting cabin. The unit is still running strong. His TOTAL electric bill on the budget plan is $168 per month, and he air conditions all Summer in addition to heating all Winter. The DeSuperheater on the Hydron supplies virtually all of his domestic hot water for free except for a month in Spring and another in Fall when the Hydron is not running. As for installation, I am currently assisting a Client with the installation of a 6-ton Hydron Module heat pump in Quakertown, PA. He is quite handy and able to do the basic plumbing necessary to install the system, and I am providing on site guidance. He’s saving a lot of money this way. Installing a Geo system is not rocket science. But if you are uncomfortable with “doing your own install”, I would suggest that you use the Dealer locator on the Hydron Module website ( http://www.hydronmodule.com/ ) and select from one of the installers listed there. If you want your heat pump to run 30 years without a problem, then buy a Hydron Module. If this does not matter to you, then the heat pump manufacturer does not matter. Gary, if he didn’t want to use his attic as loft space, what would you do to insulate the attic from the second floor? Did you client have to buy a bigger unit to be able to supply hot water through the DeSuperheater or are there only 2 of them? Are Hydron units more expensive than WaterFurnance units? Stephen, did Gary answer all your questions. If the attic is going to be unheated, then he can just insulated the 2nd floor ceiling/attic floor. He could still go with foam, or a combination of foam and fiberglas or cellulose; 2″ of foam sprayed on the 2nd floor ceiling (attic side), and then 12″ of fiberglas or cellulose over that. The rule of thumb for DeSuperheaters is that each ton of heat pump capacity produces enough hot water for a person. So a 4-ton supplies a family of four. The Rochester house has two adults and two teenagers. But the change from 4-ton to 5-ton was strictly for the planned addition to the home. Typically Hydron Module is the highest priced heat pump line, but it is the best equipment. It is considered the “Rolls Royce” of the industry, whereas Water Furnace (and Climatemaster) are considered to the the “Cadillac”. Hydron Module is specified by engineers more than most other systems due to its reputation for incredible quality and performance. This is great! I’m just at the point where I’m thinking about insulation, so this is really useful. For now, I have an additional question about insulation, now that that has come up. I’m a bit concerned about the offgassing of foam, and also the chemical exposure by workers who produce it. I’ve seen cellulose insulation and also cotton batt (blue jean) insulation. They both seem like much better alternatives from a health and environmental perspective. They do have a lower R value. Would either of these materials be usable under the roof sheathing? Also, I am wondering if there is a formula to use to figure out how much energy a geo system will consume (in kWh) for a certain scenario. For example, if I have a 4-ton geo heater with desuperheater running in my home described above. And that home had R-21 walls and R-38 ceiling. And the day was 20 degrees outside and I kept my indoor temp at 64 degrees. Could I calculate the energy consumption (kWh) for the day? I’ll probably have more questions once I get my energy audit results back. 64 degrees!!! Wow, I’m not coming to visit! The whole idea with Geo is that you set the temp at what you like and forget about it; no night setback, etc. They work best that way. Rigid polyurethane foam does not have any outgassing once it cures (within 24 hours or less, depending upon the outdoor temp). The installers should be using the proper protective gear. As for the manufacturers, OSHA has strict regulations for the work environments where this is manufactured (i.e.- Dow Chemical), and I can assure you that they are adequately protected. Besides, the mixing of Part A and B chemicals does not occur until it comes out of the spray head, so there is nothing for them to be exposed to at the plant. There is a whole discussion about all of this here on Anna’s site. Cellulose and cotton batt insulation are not suitable for insulating under the roof sheathing. Fiberglas is acceptable, but does nothing for air infiltration. Foam is the best option. As for calculating the heat loss, the equation is simple. You calculate the square foot area of the exterior wall surface, subtract the area of the windows and doors, and that gives you the heat loss wall area (in sq. ft.). Then you subtract the outdoor temp from the indoor temp (i.e. 64 – 20 = 44) to get the Delta T (temp differential). Next you divide the R-value into 1 (i.e. 1/21 = 0.0476) to get the U-value. Finally, multiply these 3 results together to get the total heat loss in Btu/Hr. Repeat this same process for the area of the windows and door using their U-value (from the manufacturer) and add it to the wall loss. Do the same thing for the roof area using the R-38 converted to U-value (0.0263) and add this to your other total losses. This gives you the total heat loss per hour of the house. For 1 day, multiply this by 24 hours/day. 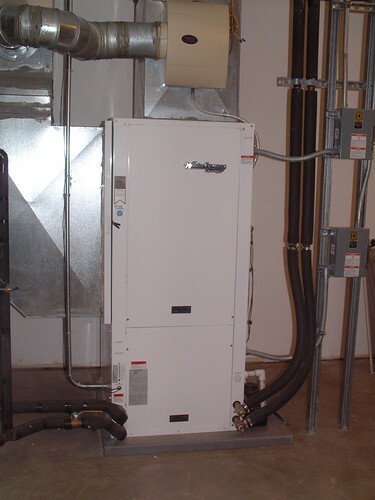 A 4-ton Hydron Module heat pump on a 50ºF open loop Geo system consumes 3.4 kW (3,400 watts) to produce 50,900 Btu/Hr. Divide your total house heat loss by 50,900 and multiply it by 3.4 to get the total electricity (in kW) to deliver that heat. If your home is 1,200 sq. ft. (1st & 2nd floor) and you heat the basement for a total of 1,800 sq. ft., then your total heat loss will be will around 32,000 Btu/Hr. insulated to the level you indicated at the temperatures you specified. For 24 hours, this totals 768,000 Btu. The Hydron Module 4-ton heat pump would use 51.3 kW to heat the house during that day. If you pay $0.15/kWh in your area (for example), this would cost you $7.69 to heat the home. In actual operation, it would actually cost less as I used a bunch of short cuts to make this calculation and made worst case scenario assumptions. By the way, if you heated your home with No. 2 fuel oil at a cost of $3.69/gallon (current avg. pricing), it would cost much more to heat than it would with the Hydron Module heat pump I just described. A gallon of oil contains approximately 138,000 Btu when burned. A typical oil furnace has an AFUE of about 84. This means that a maximum of 84% of the oil’s energy is delivered into your home for actual heating. The rest goes up the chimney. This means that you only get 115,920 Btu (138,000 x 0.84) out of that gallon of oil. If your home needs 768,000 Btu to heat it for 24 hours at the conditions you described, it means that you would actually burn 6.63 gallons of fuel oil during that day, and this would cost you $24.45 for that same 24 hours. How so? I can imagine situations where I want to vary throughout the day temperatures in different zones or through the whole house. Are there problems that will arise if I end up doing this? About the calculations… I am just realizing. Is this a simplified version of a “manual J”? I have heard this term on another forum but just now realized what it was probably for. Anna, we’re going to all be geo pros by the time we’re done reading your blog! It is just the preference of most people with Geo that I know. But if you really want to maximize efficiency and minimize operational costs, then use a programmable thermostat (which we install with all systems) and do the setbacks as you wish. Zoning with Geo is best with a maximum of two zones per heat pump, assuming you have a water-to-air unit. The reason is that the air coil needs to have a certain minimum air flow across it and, at the same time, give up a certain amount of heat. Otherwise the compressor gets upset that you didn’t use the heat it just produced. But again, Geo is not a fossil fuel type HVAC system. So the rules that everyone is so used to do not apply to a well designed Geo system. Geo is far more comfortable than any fossil fuel system could be, so all this zoning and setbacks is not necessary to save money. Yes, the equations are basically what a “Manual J” calc is doing; determining the overall heat loss for your home at a given temperature. I’m building a home just north of Houston, Tx. The first floor is 2419 Sq. Ft., it’s a story and a half. The home is pier and beam with a 4′ crawl space, and a mud slab. The crawl space and first floor walls are 11.75 ” Logix Block ICF: 6.25″ steel reinforced concrete encased in 2.75″ of EPS both sides. The roof is 2×10 with asphalt shingles. The gables are 2×6 24″ o.c. with 3/4 plywood covered with 3/4″ rigid foam. Everything is conditioned space. My questions: 1. I’m worried about condensation on the roof decking. I am totally confused by the psychrometric chart. Should I insulate the 2×10 rafters with 9.5 inches of open cell foam, blown cellulose, or 1.5″ of closed cell foam against the roof deck and cover with 8″ of blown cellulose. In the 2×6 walls I planned to use blown cellulose. 2. I’m thinking about a Geothermal closed loop system, using three wells or a pond for heat transfer. The average ground temp. is 68-72 depending on the expert. I’m considering Waterfurnace and Hydron Module. Is the geothermal system effective in Houston, can the electrical portion be powered by solar/battery? Any other ideas? I forgot to answer your question about solar. Yes, a well designed PV solar system would work very nicely in the Houston area and would generate a significant amount of electricity that would offset your Geo system’s electrical use. There are Federal Tax Credits available for the solar as well as the Geo that will save you at least 30% on the cost. The ground water temp is usually within 1°F of the average annual temp. The average annual temp for Houston I looked up says 67.9°F, so your ground water should be close to that. Water Furnace makes good equipment, but Hydron Module is considered the “Rolls Royce” of the industry. I have Client with units that have been running 30 years without any incidents. The questions you are asking about your house design are somewhat beyond what I can easily answer in this forum. I would suggest that you hire the services of a good engineer or insulation contractor for your condensation questions. But so you understand how the condensation forms, I will give you some background information. Your home generates lots of water vapor; showers, cooking, dishwasher, laundry, and you breathing. The humidity in the Houston area is high. If you are air conditioning, the humidity inside your house will be lower than it is outside. That creates water vapor pressure from the outside in; the differential in humidity causes water vapor to try and flow into your home. For the air conditioning time of year, you need to design your building envelope so that it has a strong vapor barrier on the outside of the house to keep the exterior humidity out. Without going into too much detail, your insulation system should be designed to work with this exterior vapor barrier so that any moisture that does get through will not build up in the insulation. Cellulose is not what I would even consider for a home in your area. I would go with all closed cell (not open cell) high density urethane foam. Condensation is all about “dew point”. That is what the psychrometric chart illustrates; the point where temp (wet bulb), pressure, and humidity converge to cause the water to condense and go from vapor to liquid. Warm air will hold much more water vapor than cold air will. When the humid outside air hits the cool inner surfaces of your home, the water will condense out of the air and form droplets on that surface. But since your home is not built with SIPs, you’re going to have to design your insulation system to achieve the same effect so you don’t have condensation on the underside of your roof deck and in your walls. Cellulose will settle and cause all kinds of problems. I know that I’m not really giving you a solution here; just information to think about. You really need a pro to design it for your particular building design and location. As for the Geothermal system, it will work in the Houston area, but you are going to have to be careful as you have a high ground water temp and are in air conditioning mode much of the year. If not properly designed, it will overheat the vertical loops and you will be in trouble. I would not consider horizontal ground loop; your earth is too warm. I would not consider a pond loop as you will need at least 1 acre 8′ deep per ton of cooling, and you will most likely cook whatever was trying to live in the pond. The EPA frowns upon things like that. I do not know your local regulations, but if you have sufficient water in the ground, you might want an open loop (pump from the Source to the Discharge well) Geo system. It will give you a lot better performance and flexibility if conditions go extreme (Global Warming and all). Gary, thanks for the thoughtful and inciteful reply. It’s difficult to find an expert here concerning condensation. Most of the responses to my questions concerning dewpoint and relative humidities are, “well I done hundreds of homes and haven’t had a problem yet.” When asked if they ever went back and looked they just walk off. Nice post! I would really like to know how mouch (approx) do you spend on maintenance.. Also, is this efficient? I meant, I would like to know how much are you saving? I am thinking of building a new eco home and I liked this system. Please let me know. Thank you! Billy, I pay $100 a unit maintenance a year. (Fall and Spring start up.) Since I have several, I might be getting a break. However, this doesn’t cover repair issues. I have a 10 year warranty on my units but labor reimbursement is minimal. The problem I usually have is a motor or damper wearing out or a clog. A maintenance repair in NJ could be about $200 to $300 a call. But remember that insulation is the cheapest way to reduce your energy costs. You never have to pay for heat that your house does not lose. Has there been any progress in brining the Carbon Dioxide DX systems to the marketplace? Also, What are your thoughts about the minimum distance that a return well should be to the supply well with a standing column system? If the two wells were close to each other the return water would be somewhat tempered before it leached back into the supply well. Sorry, I did not see this earlier for some reason. In regard to Carbon Dioxide based systems, Europe has several manufacturers supplying excellent systems. I am working on trying to get them in the USA. Your question about the return well/supply well is mixing two Geo well types. A Standing Column system only has one well; you pull from the bottom and return to the top of the same well. The depth of the well is 100′ per ton plus the water static level depth and an allowance for sediment collection at the bottom. A Dual Well Pump/Discharge system has two wells; the supply well and the return well with both wells needing to produce at least the flow rate required by the heat pump. The minimum separation distance should be 50′, but is well depth and flow rate dependent. In other words, if both wells happen to be in the same vein, then the shortest distance for the return water to come back to the source well must be equal or greater than 100′ per ton. Thanks for the reply Gary, I think I will contact you about installing a Carbon Dioxide System. Concerning mixing two well types, I was proposing a hybrid of the two systems. If a Standing Column system will work utilizing one well, then why not a second adjacent well to temper the return flow to the main well rather than resorting to bleeding the chilled return water? I understand what you are saying. We actually had a situation in NH where the 1st well was a gusher; over 100 GPM. We had very limited space to put in the 2nd well, and we drilled it at 60′ away; the farthest we could get on that lot. However, the 2nd well came up totally dry; BONE dry. And if the well will not produce water, that means there are no cracks to put water back into the ground. So we drilled a 3rd well in between the 1st and 2nd, got 3 to 4 GPM out of it, and that was also insufficient to return the water back into the ground. By this time, we had over 1,000′ of bore hole. So we ran an overflow pipe from the 2nd well to the bottom of the 3rd well, and then an overflow pipe back to the top of the 1st well. This gave us the equivalent Standing Column rock depth of 1,000′ and the system performs very good. However, the cost of drilling for this approach is prohibitive. It is a lot better when we hit the water that we need as shallow as possible. Gary, I’m building a home just north of Houston and am looking at a geothermal system. It will probably take a two and a three ton unit to cool the home. I have an existing water well to 365′, with a water level at 130 feet. Is it possible to use the well for an open loop system for the two units and return the water into the same well? When you say, “…take a two and a three ton unit to cool the home…”, I’m assuming that you are talking about a split system for a total of 5 tons. Generally, I don’t like split systems; there are better ways to accomplish what you need. But that is not really relevant to your question; just my personal preference. For 5 tons, you would need a water column depth of at least 500′. You have only 235′ (365′ – 130′ water level). If you were farther North or West in Texas, I would tell you to go closed loop due to the climate changes and water table issues that are going on there. If your well produces at least 10 GPM, then you could drill a second well (that would also need to produce 10 GPM) and pump from the first well (source), through the heat pump, and into the second (discharge) well. The 2nd well would need to be as far away from the 1st well as you could get it. You could not just simply use the existing well and return the water to it because it would very quickly overheat. There is not enough rock surface area in the well to dissipate the heat buildup. Your other issue is that you stated cooling only. I don’t know your weather, but constant cooling with a Geo system is problematic if it is not designed correctly. There is a point where the ground surrounding your Geo loop can no longer absorb anymore heat if the system is not designed to give a way for the earth to recover. In areas with 4 seasons, this balance happens automatically; heating in Winter cools the ground, and cooling in Summer heats the ground. I am actually working on constant cooling for a project in Humacao, Puerto Rico, where the average ground temp is 78ºF, and for another in Dubai, UAE, where the average ground temp is 82ºF. This is not a simple problem. There are many comparisons here between Water Furnace and Hydron but none touching on operational noise level. Are there notable differences in comparably sized units? No, not really. They are both very quiet. The big difference is the performance advantage (heat/cool output) of Hydron over the competition, and the Lifetime guarantee. I ended up purchasing a Hydron HXT072. It is installed and seems to work well. It is quiet when running but starts with a thump, not extremely loud, but annoying, nevertheless. Is this normal? I leave the house frequently for extended periods and lower the heat to 50 degrees. The thermostat is accessible via the internet so can be reset to a higher temperature remotely. Rapid warm up is non-essential so I had intended to switch off the backup heat strips altogether. The installer says the furnace will not run if the heat strips are not powered on and there is no way to defeat that function. Is he correct? No, the thump is not normal. You might see a slight dimming of the lights in the house when the unit first starts. This is typically an issue of your power service and can be remedied with a “soft start” kit on the heat pump. But the unit should not make any thumping or other such noises when it starts. It could possibly be the electrical contacts not pulling in correctly. The contact switch would have to be replaced. To my knowledge, the unit does not need the backup heat to be powered in order to run. I rarely install backup heat. I design the system so it is not required to begin with. The backup heat, typically powered off of the “AUX” heat terminal on the thermostat, should only kick in if the temperature that the thermostat is set to is not being met fast enough by the primary heat from the heat pump. As you stated, when you change the thermostat setting from “50” to say “70”, the big demand is most likely going to kick in the backup heat. You didn’t say what kind of thermostat you have, so I don’t know if it has the option to set a “limit” on the AUX heat. Otherwise, the only possible solution would be to disconnect the AUX wire on the thermostat and disable your backup heat. However, this would mean you have no heat in the event that it was actually needed. i had a climatemaster tranquil 27 geothermal heatpump installed in june.i just received my electric bill today, aug 10,and it was the highest i have ever seen..my old central air cond unit was over 10 years old and i never saw the bill this high.my contractor said i would see a 30 percent savings on my bill..anyone know why it went up and not done. I’m sorry to hear about your problems with the Tranquil 27 Geothermal Heat Pump. If you are still having problems, please feel free to contact ClimateMaster at http://www.climatemaster.com/residential/contact/. If properly installed, a GSHP (ground source heat pump) should be at least 30% more efficient than conventional A/C systems. The reason is that the source of “cold” for conventional A/C is the outside air which is probably at least 80ºF (otherwise you wouldn’t have the A/C on). The source of “cold” for the Geo system is the Earth which is something like 55ºF; 30% colder. There are more reasons why Geo is more efficient, but this is the simplest part of the equation. If the system is designed or installed incorrectly, you can quickly use up a lot of energy that you should not have to. For example, is your system a horizontal ground loop? Or is it a vertical bore hole? If you tell me specifics about your installation, I can give you some insight into what it should be doing. Please HELP we built a new house and were convinced that Geo was the way to go so we went with a water furnace synergy 3d but our electric bill seems to negate the cost of propane we used 4500 kw last month which made our electric bill $535. it was installed last year and our bill was high then. This last spring we had the only authorized water furnace dealer in the area come and check every thing, they found a few problems and fixed them including the boiler buddy miss wired and added a few more return vents installed the water furnace thermostat (instead of the honeywell) $3800 worth but now that it is winter we are back paying huge electric bills. Oh the original installer will not return phone calls or follow up in any way. our house is only 2400sf and we used spray foam insulation all on a slab no basement. I can not find any info on expected energy usage is this just what it cost? Any Help would be greatly appreciated. Shawn, your bill sounds high to me but I don’t know how large is your system. Gary, can you see this comment? What size is your system? Where are you located? To analyze what your Geo heating bill should be, I would need to know the location of your home, the plan (ranch or 2-story), and the exact insulation levels in the home. I also need to know exactly what model of heat pump you have (size etc. ), and if it has electric resistance back up heat. Finally, I would need to know what type of Geo loop you have; open, closed, vertical, horizontal, etc., and what your electric rates are for your area. To give you an idea of operational costs, I have a Client in upstate NY with a ranch style home of 2,400 sq. ft. He is on a budget billing plan (same bill every month), and his total electric utility cost is $168/month. This includes A/C costs all Summer long in addition to the heating in Winter, and includes all lighting, refrigerator, TV, etc. Thanks Gary for stepping in. Hi there Anna, this is one interesting article that you have done and the video is also very informative. I really like how you have outlined the geothermal loop. I am going to link to this article and use it as one of my resource. Thank you very much for sharing and keep up the good work. Thanks for posting such an informative article. Your video is very beneficial as it explains everything in brief about Geothermal Energy Ownership. Hope to see more stuff from your side.